The refrigerator is a device that extracts heat from colder part/ reservoir of the system and delivered it to the hotter sink/ environment. 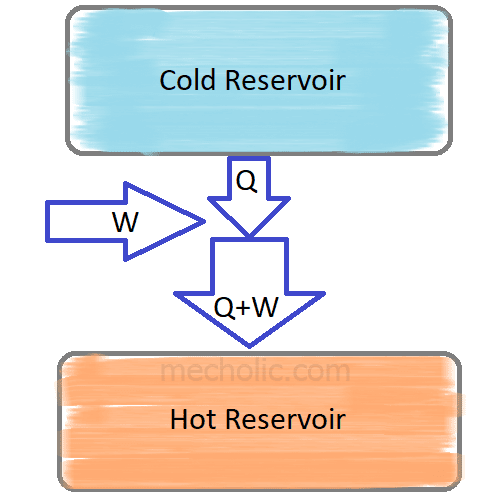 According to the second law of thermodynamics, the heat flow from a cold body to a hot body occur only by doing some outside work. The coefficient of performance of a refrigerator is defined as the ratio of useful cooling effect provided by the refrigerator to the work required. - What are the temperature limitations for refrigeration cycle (Reversed Carnot)? A cooling system usually has heat loss during the operation. So its C.O.P is always slightly different from its theoretical C.O.P., the new C.O.P. is known as Actual C.O.P. Relative coefficient of performance defined as the ratio of actual C.O.P. to the theoretical C.O.P. Relative C.O.P. = Actual C.O.P./Theoretical C.O.P.